Inspired by the I Heart My City feature on the Intelligent Travel page of National Geographic, I decided to create my own list for Denver. For your enjoyment, I present: I Heart Denver. The first place I take a visitor from out of town is Red Rocks. When I crave sweets I always go in search of the Denver Cupcake Truck (you can follow them on Facebook). To escape commuter traffic, I head out via RTD light rail. If I want to ride my bike I go on the Cherry Creek Trail. For complete quiet, I can hide away in Cherry Creek State Park. It's surrounded on all sides by the city, but when you're out in the middle, you can't tell. If you come to Denver, get your picture taken with the Blue Bear at the Convention Center. If you have to order one thing off the menu from Biker Jim's Gourmet Dogs it has to be the Tahini Grilled Cauliflower (and a gourmet dog, of course). Sweet Action is my one-stop shop for great ice cream (blackberry marscapone chile or lemon ginger cookie anyone?). 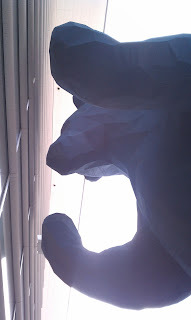 When I'm feeling cash-strapped I go to the Denver Art Museum on the first Saturday of the month (Free day!). Photo ops in my city include the pianos on 16th street mall and the giant broom and dustpan at the Denver Art Museum. The best vantage point of the city is the sundeck on the top of floor of the Museum of Nature and Science. The most random thing about Denver is the sheer number of charity walks, runs, and rides that are available every weekend almost all year round. In my city, an active day outdoors involves your choice of: bike, running shoe and/or dog. My city's best museum is The Cell - they just have one exhibit which is called Anyone, Anytime, Anywhere. It's about terrorism. To find out what's going on at night and on the weekends, read Westword. You can tell a lot about my city from the number of bike paths. In spring you should eat as many places as possible during Denver Restaurant Week (and then enjoy some spring skiing to work it off). In the summer you should graze through all the farmer's markets, go to Film on the Rocks and City Park Jazz. In the winter you should join the masses for the annual Parade of Lights. A hidden gem in my city is Old South Pearl Street. If you like beer, don't miss the Great American Beer Festival in September…it's already sold out, so you should plan ahead for 2012. Just outside of Denver you can visit Garden of the Gods, Estes Park and Mount Evans. The best way to see my city is by walking the different neighborhoods. If my city were a pet it would be a very enthusiastic and active golden retriever.